Best friends Nonie, Jenny, Edie and Crow are so close to beginning glittering careers. So why do their challenges suddenly seem so overwhelming? The girls have choices to make. Who will wait for fame and success? Who will emerge an outright star? Who will fall in love? And who will turn her back on her dreams? Yay! It's finally here! I've been waiting for this book to be published since about this time last year! Maybe even longer. 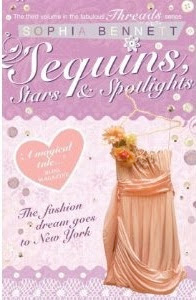 Sequins, Stars and Spotlights is all about....well, sequins stars and spotlights! This novel seemed to mainly focus on Nonie and Jenny. The girls are all moving on with their careers....except Nonie. Nonie feels stuck. She's working temprorarily at Miss Teen but all she's doing is making the tea for the 'important people.' Suddenly, she doesn't know what to do with her life. But all of that is put on hold when her friends start having problems that need to be solved. Jenny admits to something very serious (an amazing and surprising twist.) which almost causes a fall-out between them all. Edie becomes very tired with everything (running her blog, applying for universities, running campaignes, helping her friends, studying, trying to save the world....the usual.) Everything's happening at once. Will the girls stay friends and manage their lives at the same time? I SO loved this book too! This is one of my favourite series! Fab review! Ah, we're glad you loved it! Sophia's a busy little bee, if she's not writing she's visiting schools and libraries and festivals all around the UK.